The last weekend of August is always a special day in the lives of the Christian Faithful at St Peregrine’s Parish. It is a time of festivities where everyone gives thanks to the Lord for all the blessings received in the year especially the blessings of our fields. This year however seems to be a year of 50’s in the Kingdom of ESwatini with our Country commemorating 50 years of independence and 50th birthday of His Majesty. 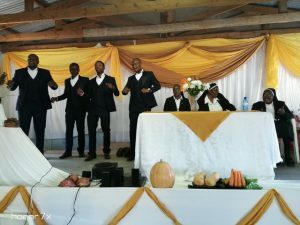 On the 26th of August at bulandzeni community under Chief Ndlaluhlaza there was a celebration of Sister Paulina Nyawo’s 50th anniversary of service to God and His people. 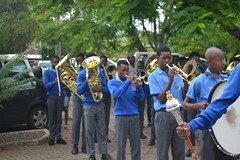 The celebration began with the celebration of Mass presided by Reverend Father Wiseman Nkomo. 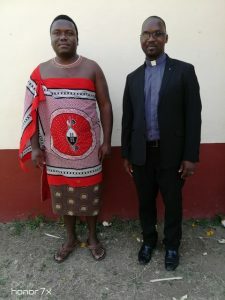 Present at this occasion was Chief Ndlaluhlaza who in his address to the congregation thanked the Lord for being with the nation during the time of elections. He congratulated the nation for hosting an elective process that is free of any bloodshed and emphasized the fact that what the nation has should value such gift and safeguard it because that is what sets us apart from any other African country. 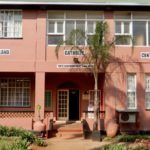 Congratulating Sister Nyawo he alluded to the good work that the Catholic Church is doing in the Country, saying that he himself is a product of the good work of the Church since he received his education in a Catholic School. He also encouraged the congregation to take care of those who serve them saying these depend on them for a dignified life. 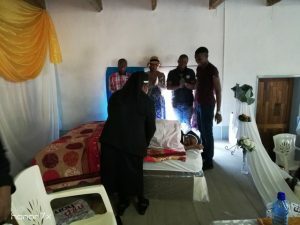 The celebration was a witness to the importance of steadfastness, humility, patience and God’s providence in a life of one dedicated to a life of service and we pray that the Lord may continue to bless his Church with men and women who will dedicate themselves to the service of the Church and God.